Test review Sonos PLAY:3: How good is the wifi speaker really? The PLAY:3 speaker is a mix between PLAY:5 and PLAY:1. It is medium sized, yet it has the capacity to deliver a rich and full sound. The slightly convex front provides an even sound throughout the room and is quite an eyecatcher. 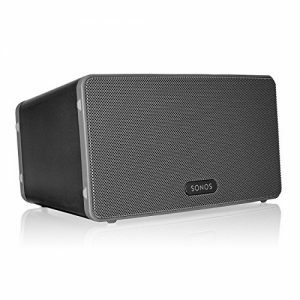 Typically for Sonos, the PLAY:3 is available in white or black (which is more of a dark gray, actually). The material is premium and the speaker, which does feel valuable, although the case is made of plastics, is covered with an aluminum grid. If there is not enough room for the speaker, it can also be placed vertically. Small rubber knobs on two sides are giving it stability. Like all Sonos speakers, this one also comes with only an ethernet port and three buttons: volume up and down and mute/pause/play. The speaker comes with a flat, white ethernet cable and a power cable that is fixed very firmly to the router. The power adaptor is integrated. Installation is really easy. You will need a router and the Sonos controller app. More on the details can be found in the how-to-article. In general you can choose between a wireless wifi connection or a direct connection to the router through an ethernet cable. I recommend the latter. If you should encounter problems with reception or transmission, there is a Sonos Booster available that can be integrated into the network to enhance and expand the signal. I have never needed it yet, though. Sadly, Sonos stick with their three button system. This will probably never change – which is a pity. Bose demonstrate beautifully, how it can be done. And direct choice buttons for radio stations would really be helpful. The speaker has a screw thread on its back side which is meant for wall mounting. There are some recommendable wall mount sets available on Amazon. Another small downside is the lack of any AUX- or USB ports – sadly this is only available for PLAY:5. I don't know why they are not as systematic here as with the buttons, but it is a pity nonetheless. Back side with screw thread for wall mounting. I could definitely hear that a three-way system is at work here. Treble, mids and bass are clearly distinguished and the speakers produce sufficient pressure playing at low as well as at high volume. If this is not enough for you, you can add a second box to create a stereo pair: They will be playing absolutely synchronous and in real stereo sound. This means twice the action. Sound details can be set with the equalizer which also has a ''loudness'' feature for low volume levels. This enhances the bass, therefore I usually have this activated. With some other speakers the level of bass you hear depends on your position in the room – with the PLAY:3 on the other hand, the bass is always present and strong enough for a good sound. In some environments the TruePlay feature might come handy: It only works with iPhones and uses their microphone to calibrate sound settings. You should definitely give it a try! Brilliant sound and great handling are marks of this speaker. I would wish for direct choice buttons, but the app is neat and intuitive.